The container farm has about 2 acres worth of space. While it's hard to imagine cold, wet winter arriving anytime soon, planning for the inevitable change in weather is a fact of life for most farmers. At Coeur Greens, however, the changing weather is a non-issue, unless there's a power outage. That's because Coeur Greens, in Hayden, grows microgreen and lettuce varieties hydroponically inside a Freight Farm, a branded shipping container modified to address plants' every need: nutrients, in the form of liquid fertilizer; sunshine, provided via LED lights; air circulation and an appropriate growing medium for every stage of the plant's life cycle. It's 80 degrees in the farm's prep room, but a pleasant 63 degrees inside the container where Kelly Lattin, Coeur Greens' operations manager, demonstrates the process for growing lettuce. 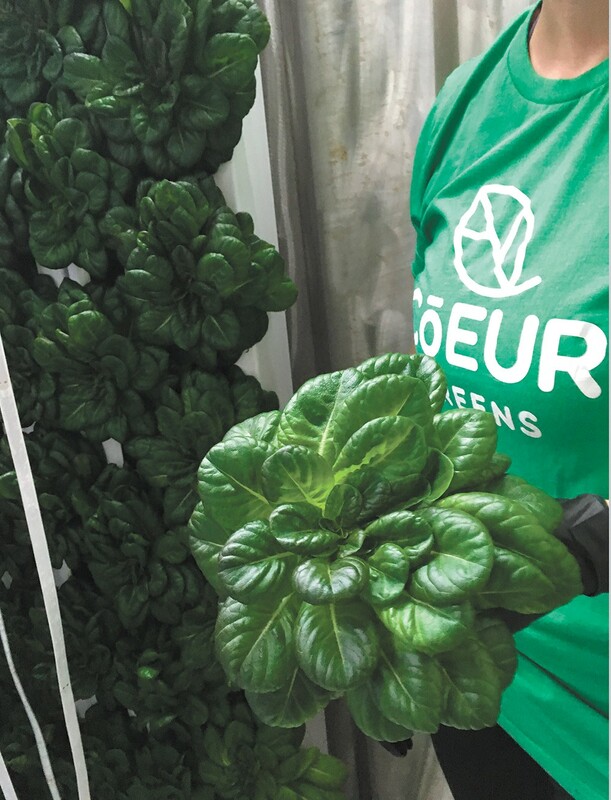 First comes the varietal selections, which Coeur Greens is still experimenting with. Currently, they're growing green and red butterhead lettuce, and have tried oak leaf and romaine. Seeds are planted into peat moss pods and fed nutrients in water that Coeur Greens trucks in from land it owns above the Rathdrum Prairie Aquifer. The vertical farm's hydroponic system allows it to use up to 90 percent less water than a conventional farm of its size; equivalent to about 2 acres. After about three weeks, the 1-to-2-inch high seedlings are ready for transplanting to vertical towers, with 10 to 12 seedlings per tower. They're hung on a rack system, where high-efficiency LED lights cycle on and off, simulating sunlight. Throughout the process, temperature, water and other factors must be monitored, and there's considerable cleaning involved, says Lattin, who's outfitted in a hairnet and booties. The whole system is capable of holding up to 2,500 plants and can be controlled by a mobile app. To harvest the lettuce, says Lattin, employees twist it off at the root, keeping some of that portion intact for a yield of around three ounces. Coeur Greens sells three-bag heads for $5 at both the Wednesday and Saturday Kootenai Farmers Market. Local restaurants using its produce so far include Fire Artisan Pizza, with locations in Spokane and Coeur d'Alene. In addition to lettuce, Coeur Greens produces microgreens, such as lemon basil and radish, in 3-ounce containers ($5). Without exposure to non-artificial sunlight and weather, what's missing from their lettuce and microgreens? Nothing, says Lattin, noting that not only is the lettuce ultra-local, there are no pesticides used, because there are zero bugs inside the growing facility.